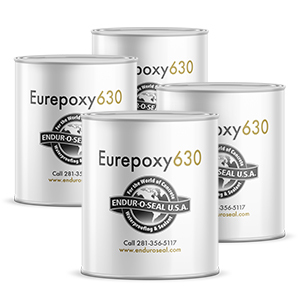 Eurepoxy 630 Crack Repair is an excellent flexible system for repairing cracks in concrete surfaces where flexibility is mandatory and elongation is required. The perfect solution for crack or small pit mark repairs in Garage Floors, driveways, patio's, plant floors, basement floors, office floors, parking decks, warehouse floors and more. A self leveling concrete crack repair epoxy that is pourable and will seep down into the lower reaches of the crack. Eurepoxy is self tacking and has a tenacious bond to all clean concrete. Elongation is 300%, Flexural is 12,000 to 16,000 psi. Tensile Strength (Ultimate) 7,000 to 8,000 p.s.i. Tensile Modulus 30,000 to 40,000 p.s.i. Flexual Modulus 10,000 to 20,000 p.s.i. Cracks should be chased to 1/2" minimum depth using 4” right-angle grind or Pearl crack chaser. All foreign matter interferring with adhesion must be removed. Install Ethyl-Foam backer rod if crack will not retain liquid Eurepoxy 630. Mix thoroughly. Resin and Hardener are manufactured as multiple viscosity products. It is important to stir or roll containers prior to mixing. Mix measured one (1) part Hardener "B" and one (1) parts Base Resin "A". Accurate measurement by volume must be adhered to. Pour mixed Eurepoxy 630 into a small plastic garden type watering bucket for distribution into cracks. Eurepoxy 630 will seek it’s own level while seeping down into crack. A second pour may have to be used to bring crack fill to surface level. Broadcasting sand over entire crack repair to prevent tracking during cure time and to color blend to existing surface. Note: Lay strips of masonite or similar material over cracks if immediate traffic use is required. Sign up for do-it-yourself tips, promotions, and news. © 2016 ENDUR-O-SEAL USA. All RIGHTS RESERVED. All Texas sales are subject to %6.25 sales tax.